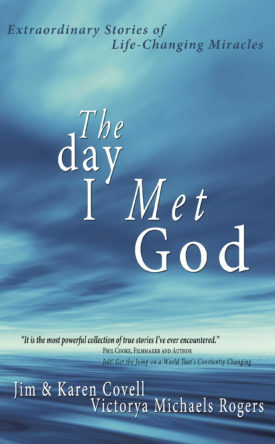 “Karen and Jim Covell and Victorya Michaels Rogers have done a wonderful job of bringing together a diverse collection of inspiring stories of how God broke into the lives of ordinary people—often in extraordinary ways! “Encountering the God of the universe is the most important experience in life, and this is a remarkable compilation of those moments. The Day I Met God is the kind of book that will change your thinking about faith and what it means to believe. Jim Covell is a composer, writing music for feature films and television shows. He also speaks across the country with his wife, Karen, scores films for his two sons, Christopher and Cameron, and rebuilds his house, one room at a time, in his spare time. Find out more about Jim at www.jamescovell.com. Karen Covell is a TV Producer and the Founding Director of The Hollywood Prayer Network (www.hollywoodprayernetwork. org). She and her husband Jim, speak all over the country about The Hollywood Mission Field, Prayer, and How To Talk About Jesus Without Freaking Out. They live in Los Angeles with their two sons, who are also filmmakers. For more information on Karen, check out: www.karencovell.com. Victorya Rogers spent sixteen years working in Hollywood, most of those as a talent agent. For the past 14 years she has been an author, speaker and life coach specializing in helping women make better choices in love and life so they can finally live the life of their dreams. She lives in a suburb of Dallas with her husband, Will, and their two children, Katie and Matthew. For more on Victorya go to her website: www.victorya.com.